Jull Dajen is in our case a trio, but usually a band of six musicians from all over the Czech Republic. They play an interesting mix of "jazz-folk inspired by renaissance". Thor Garcia is one of the most exciting practitioners of the "new writing" movement, Thor Garcia is the author of "Tund" and "Smell" (both published by The Adam Moss Group). Mr. Garcia currently resides in Prague. Vincent Farnsworth - as a poet, managing editor of the late journal JEJUNE:a.e.i.y., Vincent Farnsworth does Deep Poetics like none other. A longtime Prague resident, he is the author of "Immortal Whistleblower" (Lavender Ink - New Orleans). Alchemy featured Surrealist poet/artist Kateřina Piňosová. 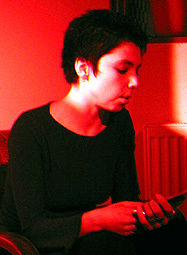 Kateřina Piňosová, born 1973 Prostějov, Moravia, is a poet, graphic artist, translator and an active participant in the Czech-Slovak Surrealist Group. Her work - in its varied media - has appeared in several journals, including 'Analogon', 'Intervence' and 'Optimism', and in "Surrealist Women: An International Anthology" (Penelope Rosemont, Ed., University of Texas Press, 1998). In addition to many group shows with the Czech-Slovak Surrealist Group, Pinosova has had several solo exhibitions of her art work in the Czech Republic, the United States and in France. Her books include a collection of poetry,"Housenka smrtihlava" (CZ. Edice Analogon, Prague, 2000), and a collaborative work on the motifs of the Ogham incorporating Piňosová's artwork and poet Laura Conway's texts, "The Alphabet of Trees" (ENG. Concordia Press, Prague, 2002).